As the 19th century became the 20th, Riverside Drive saw the erection of mansions that rivaled those along Fifth and Madison Avenues. Millionaires were lured by fresh area and the breathtaking views of the Hudson River from the high cliffs. Builder Joseph A. Farley got in on the action. The son of Terence Farley, a well-known builder for many years, Joseph went into business for himself around 1895 focusing on the rapidly developing Riverside Drive area. By 1900 he had erected more than 25 houses in the neighborhood between 105th to 108th Streets, and on West End Avenue. In 1901 he began construction on four magnificent houses designed by James & Leo on Riverside Drive between 105th and 106th Streets. They would be his undoing. Farley paid the staggering amount of $160,000 for the building lots alone—about $3.5 million in today’s dollars. The total cost of the project would rise to around $430,000. But the results, completed in 1902, were magnificent. The three mansions facing Riverside Drive were nearly identical—French-inspired townhouses fit for New York’s wealthy upper crust. But the corner house was the show-stopper. 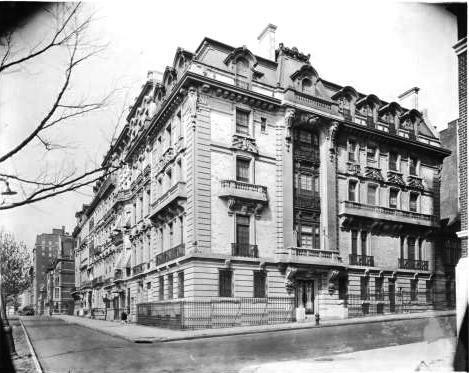 Although the entrance was squarely on West 105th Street, the residence took the more prestigious address of No. 330 Riverside Drive. 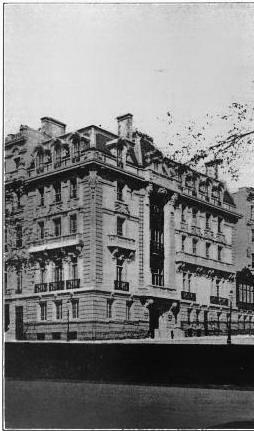 A grand Parisian mansion, it stretched eastward along West 105th Street and turned a shoulder to its less impressive neighbors. The architects blended exquisitely carved limestone with buff colored brick to produce a restrained and elegant design. Ornamentation was reserved, on the whole, for the window openings while large areas of façade were purposefully left blank. Financially Farley had stretched himself to the limit to construct the lavish homes. And by the end of the year, when none of them had sold, he was in trouble. On Christmas Eve 1902 The Sun ran the headline “Builder Jos. A. Farley Fails.” The blame for his bankruptcy was placed squarely on the new Riverside Drive houses. “Inability to sell the houses is given as the principal cause of the assignment,” said the newspaper. The mansions, of course, would eventually sell and No. 330 became home to Robert Benson Davis—founder of the Davis Baking Powder Company—and his wife and daughter. When the fabulously wealthy Davis was in his 40s, he had married the teenaged Jennie Weed. The couple had one child, Lucretia, born in 1886. In 1905, a few years after the family moved into the 25-room Riverside Drive mansion, Davis purchased their sprawling country estate “Hillcrest” in Cazenovia, New York. Divorce was not on the agenda of Jennie Weed Davis. When her husband became ill that year, she grasped the opportunity to control him. According to newspaper reports in 1911, he told a judge that “when he was taken sick she ‘usurped’ his business in Hoboken and surrounded him with spies that made of his home a prison.” Jennie intercepted the mail and kept Davis locked in the bedroom on the fourth floor until September 1910. Jennie initiated a search for her husband, whom she still maintained was incompetent. A special report to The New York Times on September 26, 1910, said “It is understood here that Robert M. Davis, a wealthy baking powder manufacturer, 70 years old, has eluded the efforts of relatives to detain him at his New York home, 330 Riverside Drive, but he has not appeared here [i.e., the country estate]." Two days after the shocking testimony of imprisonment, guards, spies and threats of his daughter losing her virtue, Davis was denied his plea for divorce because he was not a California resident and the court had no authority. Jennie, almost immediately, filed a suit for “separate maintenance.” She received a monthly allowance of $1,500 as well as $1,500 for costs. Somewhat unexpectedly, with everyone disappointed at their own rulings the family traveled back to New York and continued life in the Riverside Drive mansion. The Davises were seen at their customary box—Box H—at the Metropolitan Opera during Saturday matinees despite the many lorgnettes one might imagine were focused on Jennie. On September 8, 1915 Lucretia Weed Davis was married to George Shipman Jephson in St. Peter’s Episcopal Church in Cazenovia. 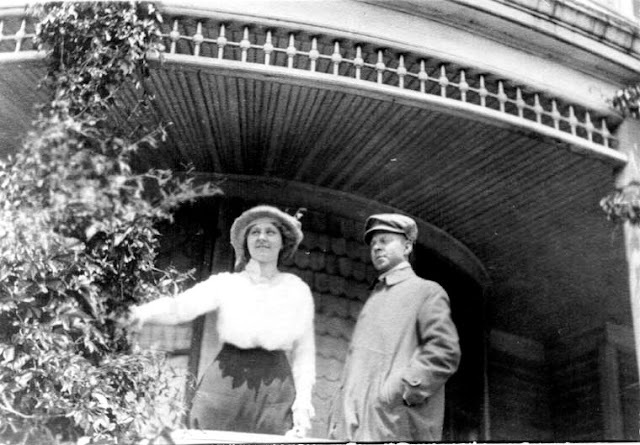 The newlyweds lived on in the Riverside Drive house and George was given a job at the R. B. Davis Company—as President. Ironically three months later Jennie Weed Davis died. The scheming wife of the millionaire—three decades his junior--did not live to inherit the estate. Her funeral was held in the Riverside Drive mansion on Tuesday, December 28 at 2:30 in the afternoon. Robert Benson Davis lived another five years. On Thursday, February 19, 1920 his funeral, too, took place in the house. Lucretia and George maintained the Davis lifestyle. They lived on in the Riverside Drive and Cazenovia mansions and kept Box H at the Opera. With the coming of the Great Depression the grand mansions of Riverside Drive began being divided into multifamily homes or razed for modern apartment buildings. Perhaps to protect the exclusive nature of his block, George Jephson bought the adjoining mansions on Riverside Drive as they became available. At the beginning of 1933 he already owned No. 331 next door (where, by the way, film actress Marion Davies had lived) and in February that year he purchased No. 332. “Mr. Jephson now controls a frontage of 78 feet in a block containing several private homes,” reported The Times on February 8. On September 30, 1951 George S. Jephson died in the summer house at Cazenovia. Four years later, deciding to live solely in Hillcrest, the aging Lucretia sold the three Riverside Drive mansions to Fred H. Hill. If New Yorkers were concerned that the large parcel would mean the end of the lovely mansions, they heaved a sigh of relief when No. 330 was quickly resold in January 1955 to the Brothers of the La Salle Provincialate. The group, parochial school teachers, planned “to occupy the house for a residence in place of their present living quarters at 112 West Seventy-seventh Street,” reported The Times. Lucretia Davis Jephson lived on in Hillcrest until her death in April 1979 at the age of 93. Meanwhile, the Provincialate remained on at No. 330 Riverside Drive until 1978. Unlike many of its neighbors, the Davis mansion has never been broken up into apartments. Its stately presence is a reminder of a time when millionaires rebuffed Fifth Avenue for the vistas of the Hudson River. The Lost Billings Mansion -- "Tryon Hall"